After a lot of media coverage on my Clear Look at BC LNG report, Rich Coleman, Minister of Natural Gas, weighed in saying “the report ignored the studies of B.C.’s own scientists” and “they don’t do their research”. In fact, if Mr. Coleman had bothered to read my report, my numbers are cited from BC Oil and Gas Commission reports – the scientists Mr. Coleman employs. The BC Government states that “British Columbia’s natural gas supply is estimated at over 2,933 trillion cubic feet” and “British Columbia has more than an estimated 2,900 trillion cubic feet of marketable shale gas reserves”. These statements strongly imply that this is recoverable gas and therefore is part of future supply and is marketable. 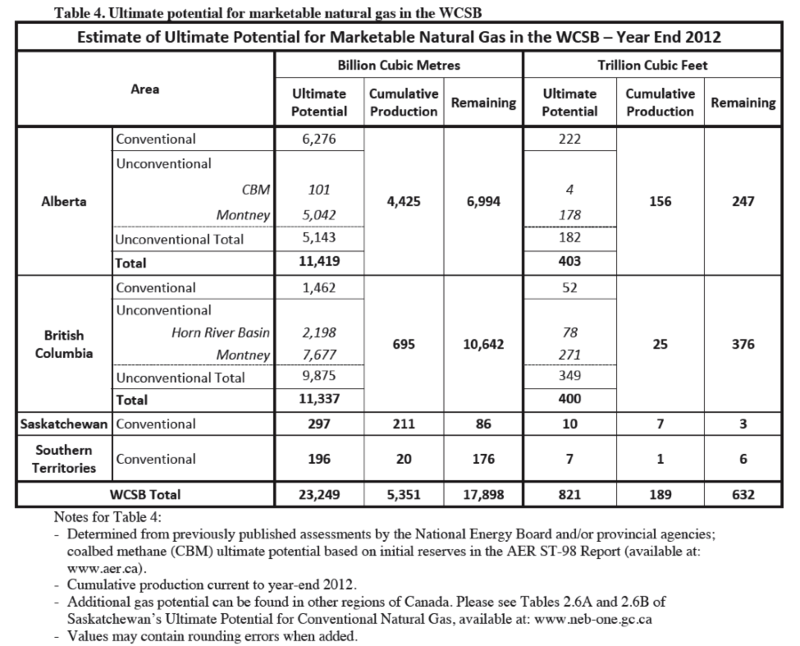 In contrast, here are the actual numbers from the BC Oil and Gas Commission (Table 4 from page 6 of the BC Oil and Gas Commission report that the BC Government claimed doubled BC gas reserves). Instead of 2,933 tcf, the table lists an ultimate marketable potential resource for BC of just 400 tcf, of which 25 tcf has already been recovered leaving 376 tcf remaining. In my report I added an additional 42 tcf from other potential sources to make sure I was being generous, of which 416 tcf is remaining. The BC Government’s claim of 2,933 tcf of “marketable shale gas reserves” is therefore preposterous in the light of information from its own scientists. It appears the BC Government has conflated “in-place” resources with “marketable” resources. “In-place” resource estimates are not recoverable – typically no more than 10-20% of the in-place resource is recoverable from shale gas plays. The National Energy Board and BC Oil and Gas Commission scientists have made a best guess at what might be recoverable and suggest it is 376 tcf, or one-eighth of the amount touted by the BC Government. I have been generous in suggesting the BC Government’s number is only overstated by a factor of six. The BC Government has also conflating “resources” with “reserves”. Proven reserves have a specific meaning in that they have been proven to exist with the drill bit and are recoverable with existing technology under foreseeable economic conditions. Reserves are numbers you can take to the bank. According to the BC Oil and Gas Commission, proven raw gas reserves in BC were just 42.3 tcf at yearend 2013, a mere 1/70th of what the BC Government is touting as “marketable shale gas reserves”. If the BC Government knows the difference between “in-place resources” and “marketable shale gas reserves”, its touting of 2,933 tcf of BC gas is deliberate deception. If it does not it is extremely shocking given that Mr. Coleman and his government are the stewards of BC’s remaining finite, non-renewable, heritage of natural gas. The BC LNG Alliance, an industry lobby group for seven LNG proponents, simply parroted BC Government statements. Its President, David Keane, “said 2,933 trillion cubic feet is a figure that the commission and energy board geologists “do believe we have.”’ Keane further accused me of “cherry picking some of the facts”. If Keane had read my report he would have seen it is based on National Energy Board projections, not mine, so if anyone is to be accused of cherry-picking it is the NEB. The BC Government and the BC LNG Alliance have no credibility on the gas supply numbers they state for the reasons listed above. But my report was about much more than that. We are dealing a finite non-renewable resource for which there are no substitutes at the scale we use it. It will be needed domestically in the long term and extraction necessitates environmental impacts. It demands a longer term plan for the sake of the environment and future generations.